Driving in the city can be a tricky business, and finding a parking space can be even trickier. Moveo, a scooter created by non-profit group Antro, is lightweight, electric and solves your parking problem because it folds up into itself and dragged on its wheels, like a piece of luggage. You can drive to work, then park your scooter by your desk. 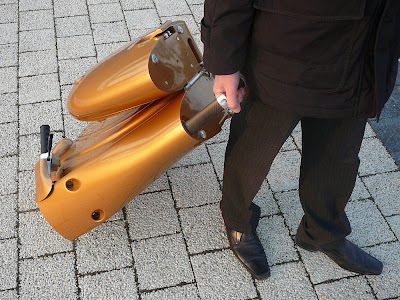 The scooter weighs 55 pounds, so it is not the lightest of loads, but it is certainly portable. 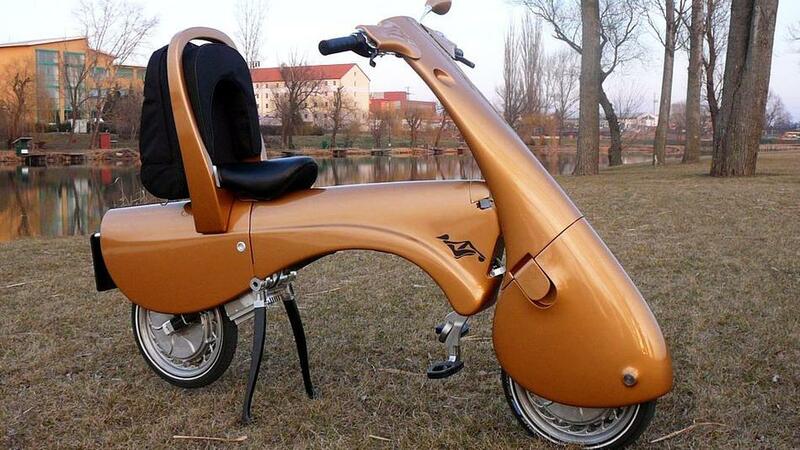 It only reaches speeds up to 28 mph and has a battery range of 21.75 miles. While this is not a vehicle for a road trip, it is certainly convenient for city-dwellers who zip from place to place and don’t want to waste time parking. The design is fully enclosed, so there is no chance of getting oil stains on your khakis, and unlike other folding scooters, it has a traditional full-back seat that is mounted on the chassis. Antro focuses on developing eco-friendly transportation. The scooter pictured is a fully functioning prototype, but the company needs to raise the funds to bring it to the masses. There are hopes to begin with a medium production line of 4,000 scooters per year, with potential growth to 15,000 scooters per year. They will cost between $3,600 and $4,600. The company plans on beginning production next year.